The Hungarian guitarist József Eötvös, artistic director of the international Guitar Festival of Esztergom, established guitar departments in Pécs and in Budapest. His speciality is extension of the guitar repertoire, with arrangements of Chopin, Brahms and, particularly, J.S. Bach. 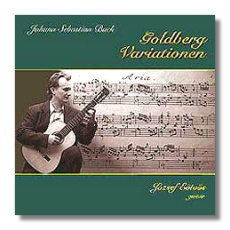 The Goldberg Variations are "…taxing for any performer, using two manuals extensively – the guitar version involves additional hardships…", writes Eötvös. He is true to the score, lucid in exposition of the successive variations, but ultimately I found it less interesting for a general listener than his newly released version of The Art of Fugue. That is another matter, a real tour de force and an amazing realisation of an extraordinary conception. Eötvös does not attempt the completely impossible; instead he has arranged the Henle edition for two guitars, tuned differently to encompass the full range of a work originally for harpsichord, but also abstract and suitable for other arrangements, which often help to clarify the part writing. They are recorded on two 8-string guitars, overdubbed with consummate artistic and technical skill. There is no artificiality in the result, and Eötvös is able to introduce subtle phrasing and articulation. To increase appreciation, and to better understand the music, the second of the two CDs has extra interactive features, accessed by exploring the readme.txt and start.html files on disc 2. The music can be heard in two ways. You can enjoy a complete performance of the whole work on two guitars, following the scores in Eotvos's edition; alternatively the parts for the first guitar are recorded separately for Contrapunctus 3 & 4 and the Canons alla Ottava & per Augmentationem in contrario Motu, for aspiring guitarists to 'play along' with Jozsef Eötvös. 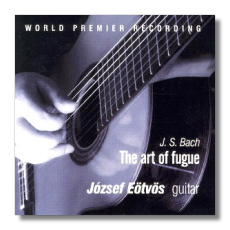 The result of it all is as idiomatic and lively rendering of The Art of Fugue as you will find, well recorded in an intimate acoustic, persuasive and untiring to hear at length. Warmly recommended.